Enhancing community connections in Cincinnati, by reclaiming alleys, sidewalks, and steps for the pedestrian. 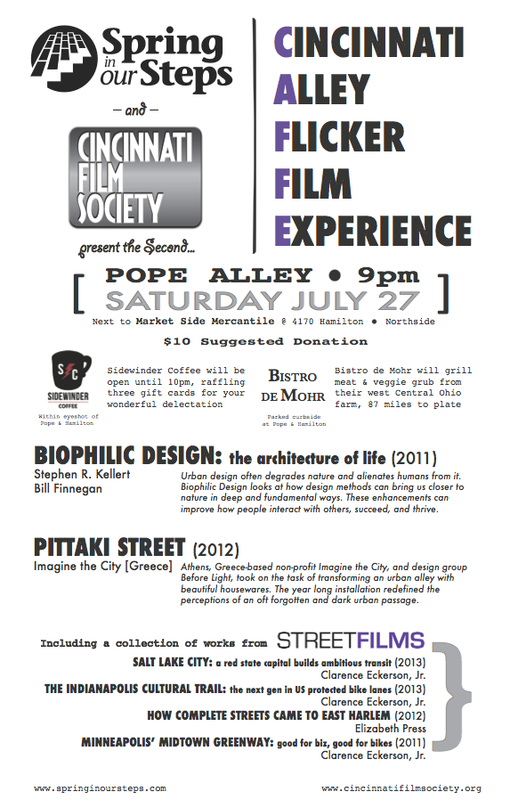 Spring in Our Steps and Cincinnati Film Society are proud to present the second installment in a series of film screenings, this time in Northside’s centralized Pope Alley. Located behind between KO-SHO (4172 Hamilton) and Market Side Mercantile (4170 Hamilton), we will be using the Pope Alley Piazza to show several films that capture innovative and activism in cities. We are all capable of matching that passion in making city life bloom. We will be lighting our section of Pope Alley with paper luminaries,connecting the business district and the merchant lot to our space. Sidewinder Coffee will be serving drinks up to showtime, including a raffle for a few $10 gift cards. Bistro de Mohr food truck will keep that stomach full! This is an event to benefit the ongoing progress of Spring in Our Steps and Cincinnati Film Society, so there will be a suggested donation up to $10. The works we’ll show generally free to screen, so we appreciate the support. We work for you, Cincinnati! Biophilic Design is an innovative way of designing the places where we live, work, and learn. We need nature in a deep and fundamental fashion, but we have often designed our cities and suburbs in ways that both degrade the environment and alienate us from nature. The recent trend in green architecture has decreased the environmental impact of the built environment, but it has accomplished little in the way of reconnecting us to the natural world, the missing piece in the puzzle of sustainable development. Come on a journey from our evolutionary past and the origins of architecture to the world’s most celebrated buildings in a search for the architecture of life. Together, we will encounter buildings that connect people and nature – hospitals where patients heal faster, schools where children’s test scores are higher, offices where workers are more productive, and communities where people know more of their neighbors and families thrive. Biophilic Design points the way toward creating healthy and productive habitats for modern humans. Athens, Greece-based non-profit Imagine the City, and design group Before Light, took on the task of transforming an urban alley with beautiful housewares. The year long installation redefined the perceptions of an oft forgotten and dark urban passage. In May, the Indianapolis Cultural Trail, a bike & pedestrian path connecting some of Indy’s most popular cultural institutions, had its long-awaited public coming out with a ribbon cutting and celebration. It’s one of the biggest bicycling infrastructure achievements in North America, and yet it’s still practically a secret. This is the story about how East Harlem residents and street safety advocates — with leadership from Council Member Melissa Mark-Viverito — banded together to win complete streets on First and Second Avenues. After the city backtracked on a plan to build protected bike lanes and pedestrian refuges up to 125th Street on the East Side of Manhattan, this coalition mobilized to put the project back on the table. Later, when the safety improvements came under attack from a few business owners, public health professionals joined Mark-Viverito and NYC DOT to combat misinformation about the redesign and see it through to implementation. The Twin Cities are undergoing a steady transformation into a more bike-oriented region thanks to nearly 100 miles of greenways and off-street paths, giving residents safe and quick travel options. By far the best-known of those paths is the 5.7 mile long Midtown Greenway, which connects cyclists to destinations through the heart of Minneapolis, from east to west. As you’ll see, the path isn’t just giving people a great place to bike, walk, and run — it’s attracting development and new businesses as well. We would suggest bringing your own seating and possibly some bug spray. We hope to see you there! #PreserveTheNati, #SeedTheCityCincy, art, community and lots of hugs. PNW to Cincinnati. Mama to #willowthepuppa. This entry was posted on July 24, 2013 by Pam Sattler in Alleys. We are a consortium of committed Cincinnati residents, who feel that forgotten pedestrian spaces can become some of the city's best assets. The group initiates community-oriented projects in Cincinnati's alleyways and city steps, as well as its most neglected sidewalks. To recreate clean and useable spaces exercises our pride in the community.